Night scenes – you either love ’em or hate ’em. A true night scene should be, more or less, colourless. When light levels are low the daytime optical receptors in the eye don’t function and the night, or low light, receptors kick in. Rods and cones are the shapes of these two light sensitive cells at the back of the eye and I can never remember which shape is which cell. So a night scene painting is a work of the imagination, an illusion. We create the ‘feeling’ of night time in a picture which must have all the attractive elements of a ‘normal’ painting. The painting must be a painting rather than a picture which resembles a charcoal drawing and this means a spectrum of colour. The red, blue and yellow should be there. In this painting the red element was represented by Burnt Sienna and Raw Umber, the blue, Prussian Blue and the yellow Yellow Ochre. These were the only paints used plus, of course, black and white. An unusual item used in the painting was ‘Stand Linseed Oil’. This is a thick, syrupy form of the original Linseed Oil and by sitting this mix on top of the flat underpainting creates a luminosity which helps the moonlight effect. Linseed Oil will always add brilliance to your colours but is difficult to control and takes ages to dry. Liquin handles great and dries quickly but dulls the colour a little. I usually mix these two media, 50/50, and get the advantages of both. In due course I will post the time lapse video (9 minutes) of the work, which took about 1 hour to complete. P.S. A photograph of this scene would be a very different matter completely due to the limitations of the photographic lens. For a start it would be more of a silhouette against the sky and the moon would appear the size of a star unless a telephoto lens was used and that would create a whole different scene. 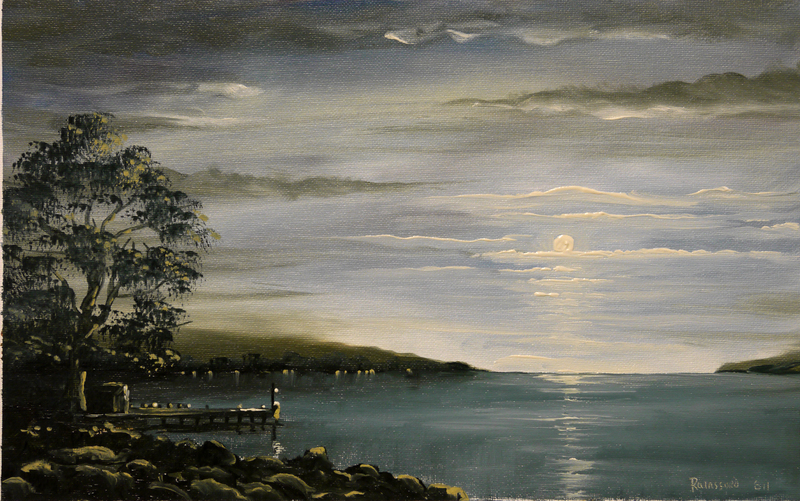 This entry was posted in Oil Painting and tagged Oil Painting, Oil Painting Instruction, Painting Moonlight. Bookmark the permalink. I really love this- the jetty leading out into the water just “makes” the picture!